Editor’s note: This is the third of a three-part story about the history of Tsalteshi Trails, the main training ground for three central peninsula high schools and the local centerpiece for skiing and running competitions. The first article discussed how the land was acquired and how the trail-making was planned. The second article showed how a confluence of motivated individuals opened up the ridge line for skiing, running and mountain biking. This week’s article demonstrates the unqualified success of the trail system and its continuing growth and refinement. Photos courtesy of Bill Holt. 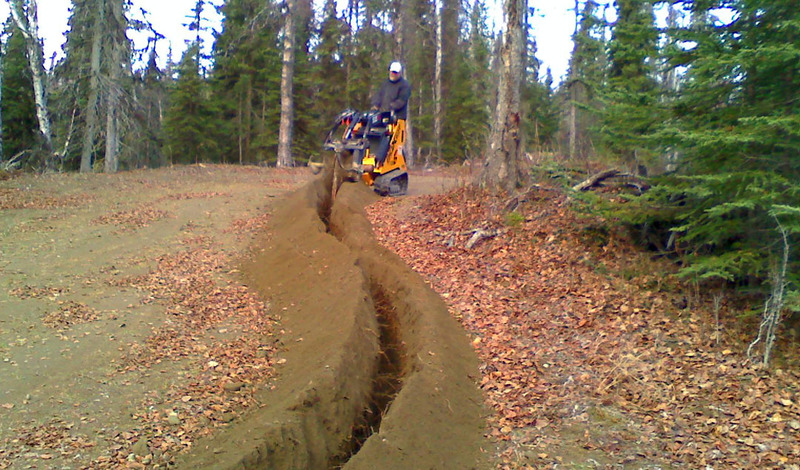 In early autumn 2009, Bill Holt creates a wire trench for the lighting systems on the Beaver and Raven loops at Tsalteshi Trails. “Back in the dark ages, Alan Boraas was digging out one of the old Ski-Do Alpine snowmachines, and I was rubbernecking nearby and asked if he needed some help,” Holt said. “We got it dug out, and he asked if I wanted to help him groom. I said, ‘Sure.’ Alan took off, made it to the top of the hill and got stuck. Lots of blue smoke and blue language. I went up to help, and the next thing I knew I was spending more and more time on a snowmachine following him around. Photo by Clark Fair, Redoubt Reporter. 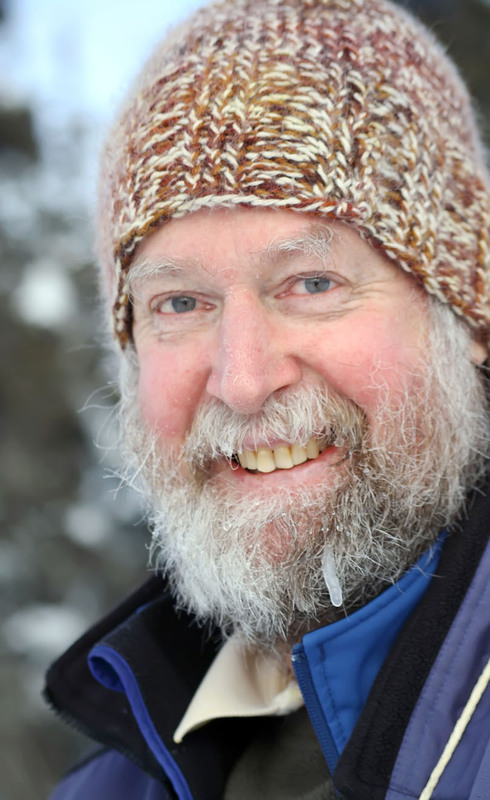 Bill Holt, with an icicle in his beard after working to prepare the trails for a ski meet in 2011. The head groomer since 2004, the tall, bearded Holt has become one of the individuals most closely associated with the trail system. His presence is nearly ubiquitous at Tsalteshi, logging hundreds of hours each year on trail-planning, building and maintenance, and on equipment and lighting. 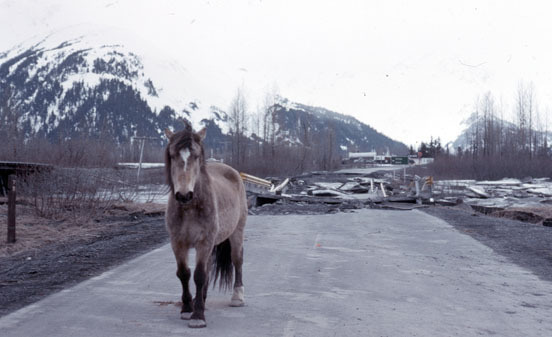 By the time Holt appeared as a volunteer on the scene in 1995, the trail system was already well on its way to becoming a fixture on the Kenai Peninsula and in Southcentral Alaska. The first three trail loops — the Green, the Blue and the Red — had been completed in a narrower, rougher form by early winter of 1990, in plenty of time to give the inaugural Skyview High School ski team a place to train and hold meets. The plan then was to create a core trail or loop that could be skied by advanced beginners without too much trouble. From that basic beginning, the “complex” has evolved into more than 15 kilometers of trails over sometimes widely varying terrain, enough to keep Holt and the other groomers and volunteers extremely busy. 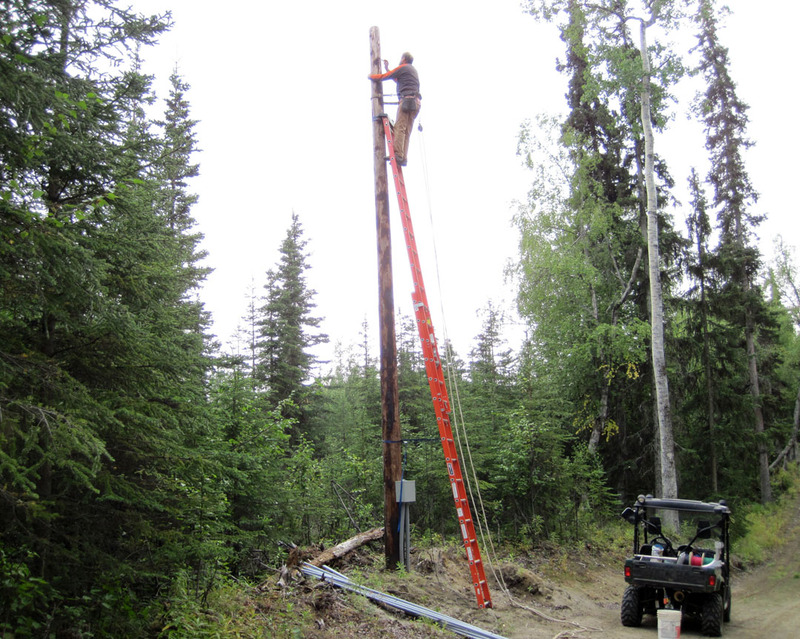 Bill Holt installs wiring for lighting on the Tsalteshi Trails system in 2009. 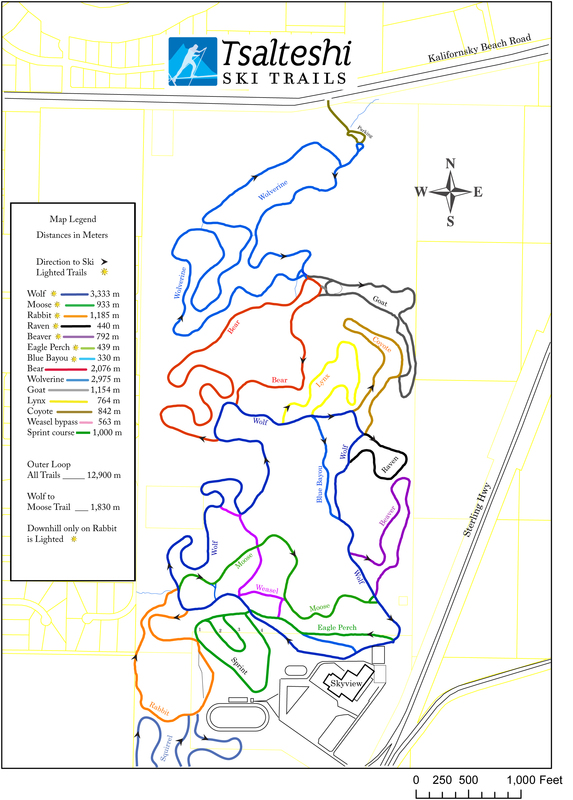 The evolution of the trail system initially included a biathlon range just off the Purple Loop — a second, more official range was created closer to the school for the Arctic Winter Games in March 2006 — and then a five-kilometer lighting system originally intended for AWG events and also to improve nighttime skiing. Discussions about lighting the trails had been in progress for many years prior to the games, but AWG-related funding and enthusiasm allowed the ideas to take shape. 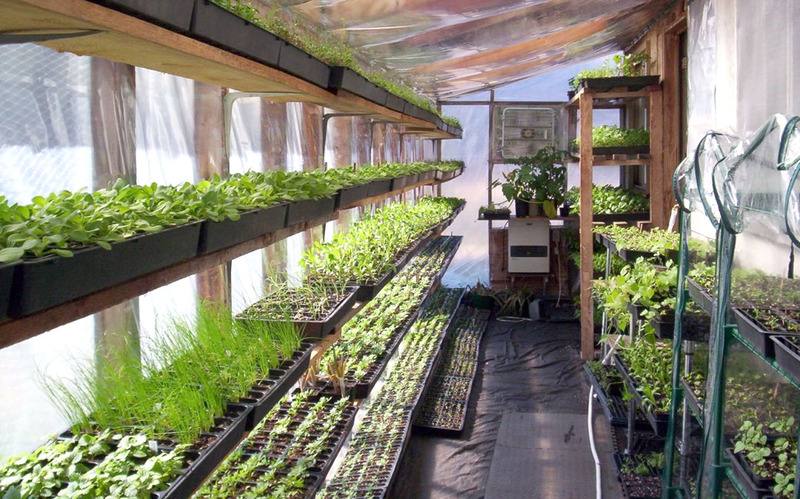 In addition to money needed for the purchase and installation of all this lighting, Tsalteshi’s involvement in the AWG brought on the association’s first flush of federal dollars. Tsalteshi received a $150,000 HUD grant and a $30,000 Recreation Trail Grant — allowing for a widening of the trails, plus the purchase of five Yellowstone Ginzu drags, two four-wheelers on tracks, a new snowmachine, 50 HID lights and wiring, timing equipment and miscellaneous racing supplies — and still a tremendous volume of volunteer labor was required to put everything into place and working order in time for the games. 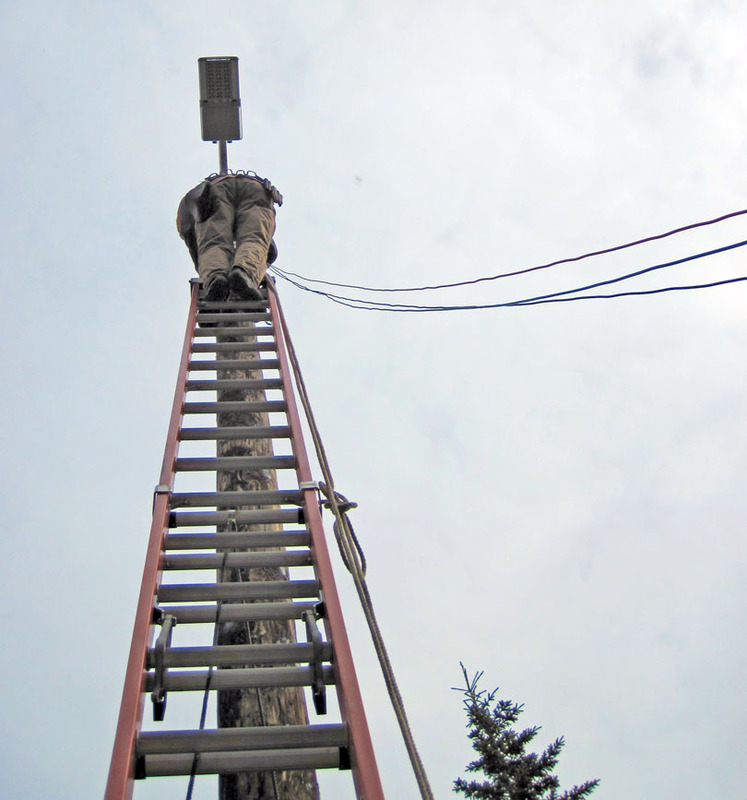 Bill Holt climbs high to work on wiring for the lighting system in 2009.
volunteer workers. The Arctic Slope Regional Corporation, an oil field supply contractor, donated engineering plans for the lighting, and IBEW volunteers helped install and bury the wiring. Manufacturing delays and poor weather made much of the work more problematic than it might otherwise have been. Since then, with the financial assistance from a $100,000 Alaska Trails Initiative grant, the lighting system has continued to expand and improve. 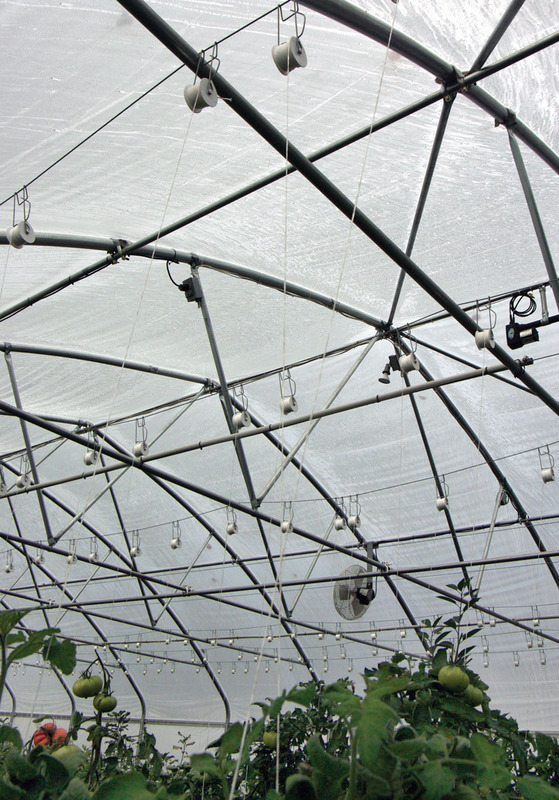 One money-saving improvement has been the installation of LED lights in place of the original metal-halide lamps. Also part of the improvements and changes at Tsalteshi in the last few years was the creation of the Wolverine Trail — the lowest-elevation trail in the system. Holt, Pete Sprague and John Czarneski worked on grant funding to build Wolverine from 2002 to 2004, with trail work completed after that. In 2006, they wrote a grant for funds to build a trail-system entrance and parking area off Kalifornsky Beach Road. 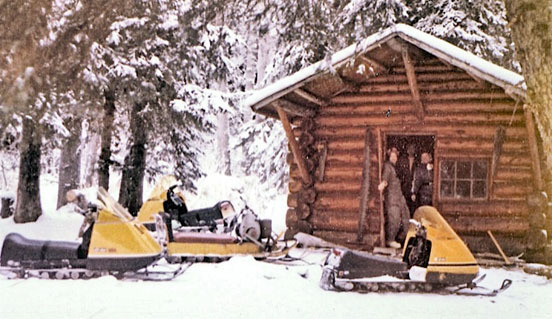 When the Wolverine Trail was being designed, Holt and Boraas were careful to hide its location from the traffic of snowmachines and four-wheelers. Originally, they received permission from the city of Soldotna to use a nearby gravel pad that paralleled K-Beach. Skiers then had to walk or ski a narrow trail across a small swamp to the trailhead. Tsalteshi received only partial funding of a grant request to build a permanent parking lot by Wolverine. In 2007, the borough gave Tsalteshi permission to build the lot and driveway and to cut down trees in preparation for the work. Further assistance arrived in the form of the Department of Transportation, which advised Tsalteshi in the driveway permitting process and facilitated the acquisition of gravel donated to the cause by Wilder Construction, which, at the time, was working nearby on the installation of a new bridge over the Kenai River in Soldotna. Meanwhile, the trails continue to evolve and expand. On the trail-work schedule is a continuation and completion of the new Squirrel Trail at the southern end of the system; the construction of the Fox Trail between the subdivision on Skyline and the western edge of the Wolf Trail; and the Porcupine Trail to the east of the Wolverine Trail. Under discussion, as well, is an underpass that would allow skiers to travel safely beneath the Sterling Highway and join up with the trail system of the Kenai National Wildlife Refuge. It’s also important to note, said Boraas, that no user fees are associated with Tsalteshi Trails. The trail system is essentially an institution now on the central peninsula, and only an extraordinary set of circumstances seems likely to threaten its existence. What’s in a Tsalteshi name? Graphic courtesy of Tsalteshi Trails, www.tsalteshi.org. 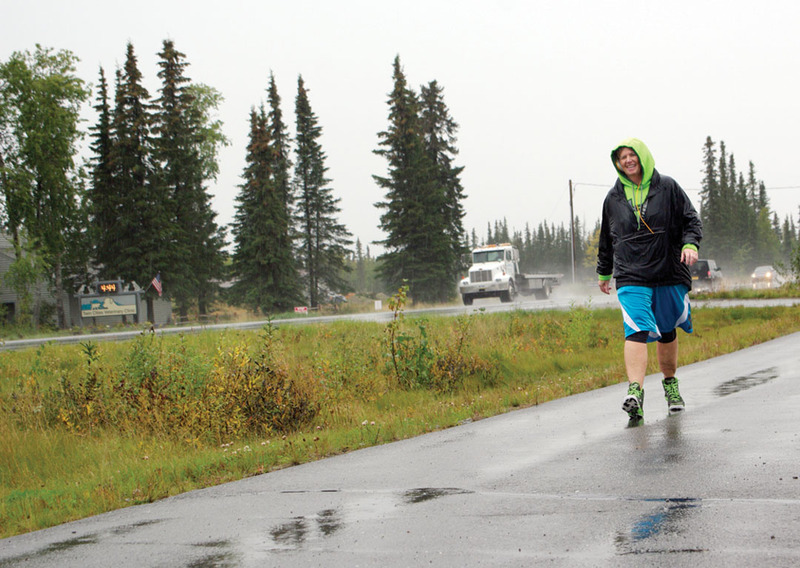 The Tsalteshi Trails, too, without its name, would likely be the same — just as popular and just as integral to the central Kenai Peninsula. However, some would argue that the name “Tsalteshi” deepens and enhances its connection to the land upon which it sits and the heritage of the people who roamed this land before any Europeans set foot here. Tsalteshi is a Dena’ina word meaning “Black Stone Axe Ridge,” and it is a good name because it is an ancient link to the land itself, not to some person who moved here from somewhere else, contends Alan Boraas, an anthropology professor at Kenai Peninsula College and one of the founders of the trail system. The name came about in the mid-1990s after a third nonprofit organization, the Tsalteshi Trails Association, became the permit holder for the trail system. In 1991, the year after the core trails (the Green, the Blue and the Red) were constructed, the Kenai Peninsula Triathlon Association, headed by Peter Ehrhardt, formed to be able to conduct triathlons on the trail system. In May 1994, members of a more ski-oriented group, including Boraas, merged with the triathlon group to form the Kenai Peninsula Aerobic Sports Association (KPASA). Then in April 1996, as the triathlon proponents began to run out of steam and skiing interest continued to flourish, the organization was renamed the Tsalteshi Trails Association, with Erin Lockwood as its first president. The name Tsalteshi eliminated a connection to the rival cities of Soldotna and Kenai. It also eliminated a connection to any particular school. It was a more neutral choice that allowed the burgeoning trail system to stand on its own merit. 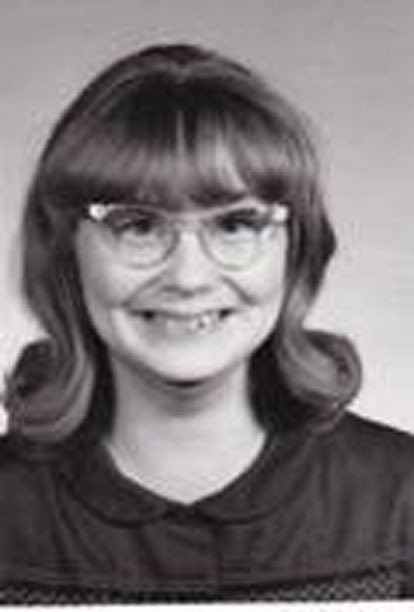 So Boraas resisted naming the trail system, or even any of the trails, after individuals, although it is with some chagrin that he admits that that wasn’t his first impulse. After the trails had been in existence for only two or three years, Boraas, inspired by the naming of trail sections at Kincaid Park in Anchorage, decided to use the names of individuals to highlight and personalize parts of the trails at Skyview. Because Skyview dominated the local skiing scene at that time, the names of Panthers skiers also dominated the sections of trail, featuring such names as Collin’s Climb — one of the only original names still in common usage, though not on official maps. Renaming the trails, then, was spurred on in part by a need to put signs out on the trails and help prevent skiers from getting lost. “I pushed for renaming the trails and giving them more neutral names, giving them animal names and then using the Dena’ina equivalents in keeping with the place,” Boraas said. Thus, the Green trail became the Moose (“Dnigi”), the Blue trail became the Wolf (“Tiqin”) and the Red trail became the Bear (“Ggagga”). One of the first intersections to be named — and still the best known — is Decision Point, which is formed where the Bear trail breaks off from the Wolf. In its earlier incarnation, the Bear was a particularly challenging downhill, followed by a long climb back up to Wolf. The intersection name was there to remind skiers what lay ahead of them if they chose Bear. And by far the most well-known of the unofficial names on the course is Kill Bill Hill, tongue-in-cheek-lovingly named for Tsalteshi’s main groomer, Bill Holt, who designed the hill. Because of its steep descent — made necessary because the Rabbit Trail had to be squeezed just inside a property line — Alan Boraas and Penny McClain applied the appellation after the first time they skied it. They meant it as a playful joke, but the name has stuck.